A cloud-based software that unifies email, calendars, and contacts. 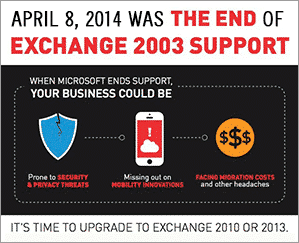 Microsoft Exchange is the world’s leading platform for unifying a business’s email, calendar, and contacts. More than 470 million mailboxes worldwide leverage Exchange to communicate, collaborate and compete at a Fortune 50 level. With Hosted Exchange, your Exchange server is installed and managed in the cloud, as a service, with no fees upfront. You get all the functionality of Exchange with none of the overhead. CompuSys performs all installation, maintenance, upgrade and support activities on your behalf for a predictable monthly fee. Our Hosted Exchange plan come bundled with the great collaboration platform, Microsoft Sharepoint to improve your company’s communication. * Support availability and response times is variable depending on contract terms.